The 9-inch colour touch screen makes work more fun thanks to easy navigation and an operation similar to today's smartphones and tablets. The newly integrated mobile touch area lifts work flexibility to a new level enabling mobile device users to connect, print and scan just by touching the mobile area on their devices. Reduce environmental impact and save costs at the same time thanks to Konica Minolta's integrated state-of-the art technology for competitively low power consumption. 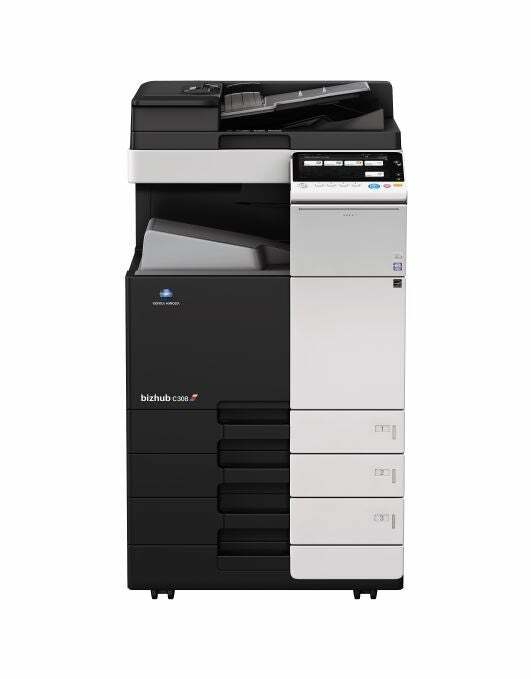 Be more efficient in preparing small and more complex copy, print, scan and fax jobs, by adaption of the MFP panel and printer driver interface to your specific needs. Increase mobility and reduce costs with mobile device applications by smoothly connecting smartphones and tablets with the system. With Konica Minolta's free-of-charge mobile device App PageScope Mobile, you'll take advantage of printing documents stress-free from and scanning jobs to your mobile device without using a desktop PC. Interested to see all features and options and build your very own bizhub C308?